The capability to 'experiment at wish' with different mixed mode set-ups was scheduled parallel to main-stream developments in the ICESTARS EM analysis. The stand-alone MECS solver has been transferred from a Matlab environment into a Python framework. The included BDF solver was extended to handle general differential algebraic systems given in a stability preserving formulation. Additionally, a general linear method solver has been included into the MECS package. Magwel provides the equations for the EM devices, while MECS provides the equations describing the circuit topoogy. It is technically realised by MECS transmitting a coupled system of network equations and equations for the electronic building blocks. The coupled system is perceived as a monolithic item and solved directly. The validation requires that the transient mixed-mode equations can be solved using the standard linear solver methods and that the number of iterations does not exceed the required number for solving the time-independent system. Convential equations for circuits in general neglect physical effects such as EM fields. They only try to re-build complex building blocks using single parameters - a procedere lacking efficiency as there might be up to 800 parameters. In addition, in the SHF and UHF range models are becoming ever more sensitive. The ICESTARS model developed by Magwel and University of Cologne intends to solve these problem by modeling the building blocks using partial differential equations to better project the physical complexity of the models. Cython is used as a communication bridge between C/C++ and Python. The data is exchanged via pointers to vectors and matrices. A shared library generates the EM solver functionality. 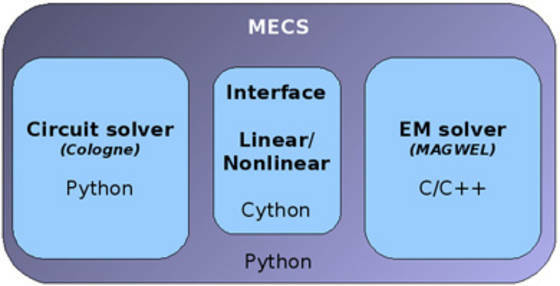 MECS starts EM solver (initialization, memory allocation, etc.). For every time step MECS calls the EM solver to address the Maxwell system and uses the EM solver’s output to calculate integrative equations. After time integration MECS stops the EM solver (deallocation of memory, etc. ).